My wife Holly and I visited Charleston over the Thanksgiving weekend and enjoyed a holiday dinner with a southern flair (that means they served collard greens on the side) at the Cypress Restaurant downtown. This wasn't my first visit to Charleston so a restaurant selection has to be unique and, in keeping with our goal of trying as many Charleston restaurants as we can, this one was as upscale as we could find on a Thanksgiving day. On Friday we began our trek through a number of galleries and I was fortunate to have obtained introductions to two of them through a buyer of my art. I found that getting a recommendation is an important step in introducing yourself to a gallery and will provide a warm welcome before you even shake hands. That was the case with Robert Lange Studios where Robert and Megan Lange were very hospitable. I do like their website, by the way. Robert has a different philosophy on presenting art and his gallery shows it. 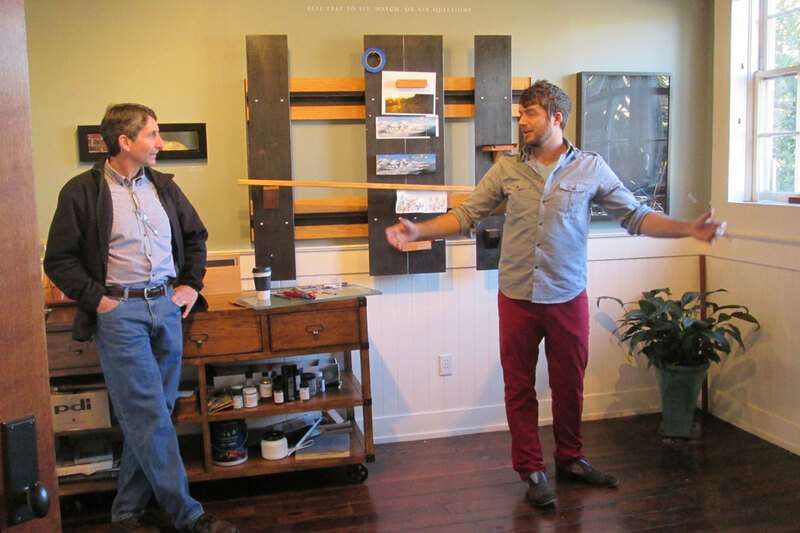 He has shaken up the established culture in Charleston with his style and has created a refreshing atmosphere that appeals across a wide spectrum of art buyers and enthusiasts. We talked about art and the business of art for awhile and I thoroughly enjoyed the exchange. Robert has built his gallery on energetic young artists who are offering contemporary realistic paintings that push and sometimes escape the boundaries of subject matter and style. But Robert and Megan are the kind of gallery owners you can't help but like and they definitely do not come across as peddlers or salesmen. They are artists. They love art. And they want you to love it like they do. 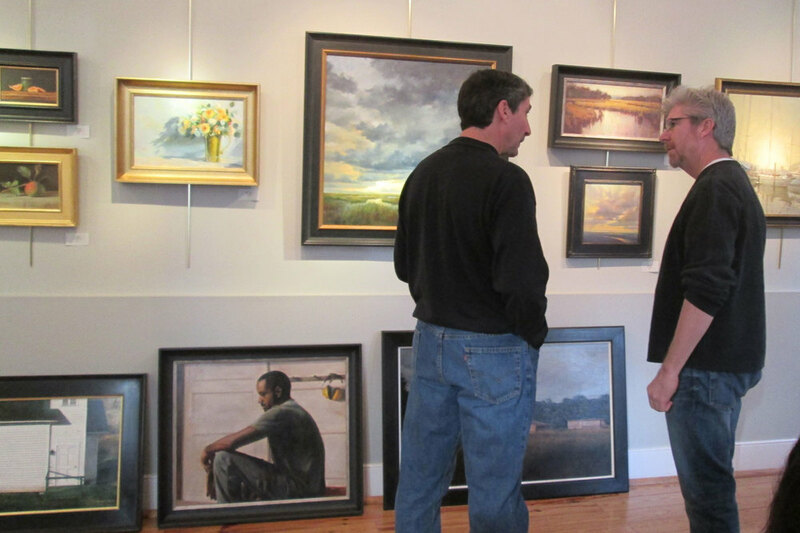 Another gallery where I received a warm welcome was at the Principle Gallery on Meeting Street. This is a second location for this gallery based in Alexandria, VA as they have moved in the Charleston area by acquiring M Gallery. The director, Carri Schwab, was enthusiastic and a pleasure to talk to as she showed us around the space and gave us an update on the changing face of art in Charleston and how their artists were being shuffled as well. I came to understand more clearly the business side of art as I came to town to market myself and discussed very forthrightly how to sell art in a city like this. Are the tastes of art buyers changing or are the tastes of artists emerging to a different plane? Many of the very talented artists that were formerly represented by M Gallery are not going to continue to be represented by Principle and the choices for the gallery are hard. They feature many nationally known artists and I would love to be included. We visited many other galleries but walking in making cold calls is expected to be hard. You will get the usual "go to our website and fill out the submission guidelines" but I have come to expect that these are simple tactics to deflect the many artists who try. I know that like any sales endeavor, this is a numbers game where you just have to try and try and try again before you finally hit the one that will say, "yes." I was fortunate to meet artist Mark Horton of Horton Hayes Fine Art who graciously spent time with Holly and I as we discussed my ambitions and the business of art. Mark looked at some originals I brought into the gallery and gave me his assessment as well as insights on how the sales in Charleston have been effected by economic trends. I appreciated his honesty and encouragement. I am still convinced that building demand for your product, which is your art, is the responsibility of the artist and I am determined to move ahead improving as an painter and as a businessman. The trip to Charleston was a total success as we built relationships that will be a great foundation for many years to come. This city is always welcoming and a joy to visit with so much to see and do that you feel you are on vacation just walking the streets. I will certainly look forward to approaching other galleries since I have broken the ice on this trip and feel all the more prepared for the next time. I am pleased to announce that I have been invited to participate in a spring show at the Robert Lange Studios (http://www.robertlangestudios.com) featuring 12 artists painting on the theme of Elements: Earth, Air, Fire, Water starting April 1st with a reception on Friday, April 5th. I will be entering 4 paintings based on this theme for sale. Hope to see you there.